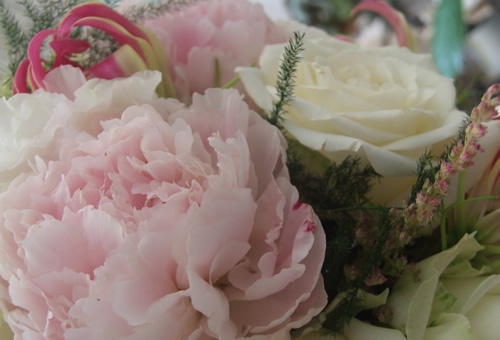 You are currently browsing articles tagged peonies. Every little girl dreams of her own fairy tale wedding, wearing the perfect dress and having a magical day with her prince charming. I’ve got plenty of ideas and inspiration to help you feel like a princess for the day. Think luxurious fabrics, flowers in soft pastel shades, twinkly fairy lights and diamantes. Choose an elegant font and timeless style for your invitations, maybe you could theme them around a fairy tale phrase such as ’happily ever after’ or ‘once upon a time’. Follow the style of your invites through for your table plan and place names. There are plenty of princess style wedding dresses to choose from, a princess line or A-line dress is an obvious choice. It is fitted at the top and hips and flares out towards the hem creating the classic princess look. Don’t forget a crystal tiara to complete your look. Your brides maids can wear any colour from the palette you are using for your flowers, blush pink dresses are a pretty colour for this theme. Castles are the ideal venue for a fairy tale theme, if you are lucky enough to live near one. Any venue with a grand ballroom would also suit this theme; town halls often have large ballrooms with ornate decorations. If you have found your perfect venue but it needs some help with decorating you can set the scene with some clever props. Event companies can set up wall drapes or star cloth to add a luxurious feel. Use star cloth behind the top table to make it the focal area of the room; they look magical in the evening. To arrive in style for your fairy tale day, organise a horse and carriage or Cinderella style carriage. Dress the outside of your venue with a beautiful floral arch in soft romantic or topiary trees with dressed with roses and big organza bows. 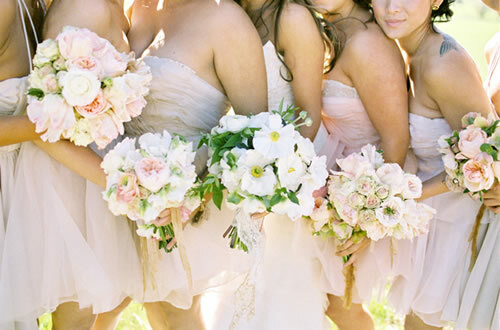 Pastel shades are lovely for a fairy tale theme, very pretty and romantic shades like blush pink, soft peach and cream. Lavish floral arrangements will really complete your fairy tale theme. 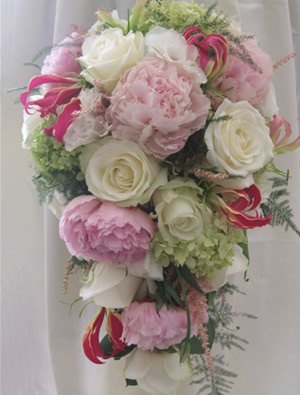 As roses are the classic flower of love, they are a must, mixed with other pretty flowers like peonies, bouvardia, cherry blossom and lisianthus. 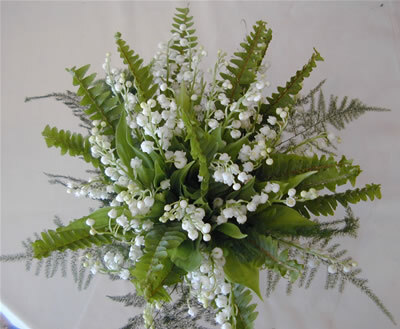 Bridal bouquets should be large and romantic for this theme, with flowing ivy or fern. Roses in mixed pastel shades or several shades of pink will give a very pretty effect. You could give any young brides maids flower wands dressed with satin ribbons. Garlands are a traditional decoration that will help create a fairy tale look. Drape them over staircases or along your top table. For an extra special effect, ask your florist to add battery powered fairy lights to them; they can be switched on in the evening. For your reception room use large floral arrangements surrounded by candle votives to continue the romantic look. Candelabras would also fit this theme well with fresh flowers and ivy wound round the arms. To make your top table even more special have it dressed with fabric drapes and ruched along the top edge with muslin or coloured organza. I hope I’ve given you some ideas to turn your wedding day into a magical fairy tale. Any good florist will have a vast amount of knowledge about flowers. They will know all sorts of useful info like which flowers are in season, what flowers look good together and they will be able to give you ideas for designs that keep within your budget. If you are meeting with a few florists there are a few things you can think about to help you choose the right one for you. 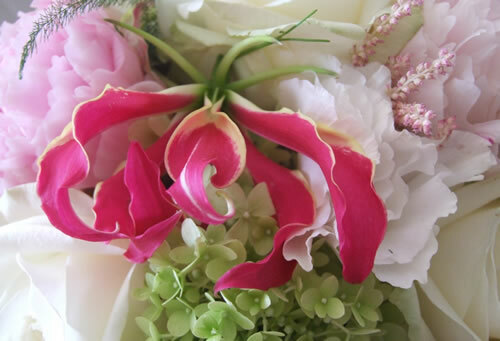 Florists will show you photos of designs to give you an idea of different styles available. Are their photos current and up to date? Some florists have a very definite style, do you like their style and their ideas? Pre-made design books and magazines are fine for getting ideas, but be sure you see some pictures of the florists own work as well so you can see the standard of their work and style. When asked about your budget you should be upfront about what you want to spend. Wedding flowers can go up or down hundreds of pounds dependent on the types of flowers you choose for your designs, some designs don’t contain many flowers but are very labour intensive and therefore cost more. If you give your florist an idea of your budget they can suggest the best flowers and designs for you and you won’t get a shock when you receive your quote. If you don’t know what you plan to spend, take a look at the flower and plant association website. They have a guide to average prices compiled from UK florists, and a list of flowers that are reasonably priced and flowers that are more expensive. When the florist discusses your colour scheme and ideas, do you feel like they listen to what you want and understand what you are looking for? A good florist will take in your ideas and translate them into designs that will work with your budget. If you have orchid ideas but a chrysanth budget they should also be able to offer alternative flowers or designs that will provide a similar effect but be more cost effective. If your budget won’t cover all the items you originally wanted, the florist should be able to suggest which items to spend the majority of your budget on to get the best impact. If the florist has decorated your venue before they should be able to suggest designs that will suit your venue and any focal areas to decorate. Ask them if they can provide a transfer service to move any items from your ceremony to use at your reception venue. Florists will charge for this but the fee is normally far less than it would be for extra designs. 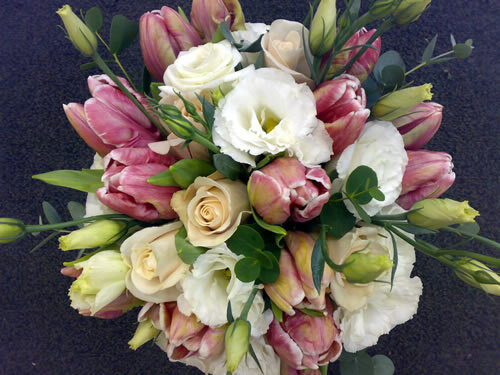 If you have looked into wedding flower costs, you should have a rough idea what your quote will say when it arrives. If you have got a few quotes spend a little time to go through them, check all the details and that your total price states all the delivery and set-up costs. If any quote stands out as drastically cheaper than others, you should consider why. You don’t want to trust your wedding flowers to an inexperienced florist or someone who will let you down the week of your wedding because they have under-priced your flowers. This also includes friends of friends or aunties who ‘do flowers’, only a highly skilled and experienced florist should do wedding flowers. I have had to fix several attempts at wedding bouquets on the day of the wedding, made by people who are not florists with poor quality flowers, just because they were a cheap option. Ultimately go with your instincts when making the decision on your florist, pick the one that you trust to turn your ideas into beautiful flowers. 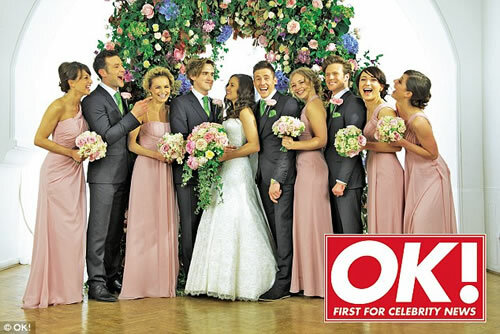 The royal wedding is only a few weeks away now and the whole country is eagerly awaiting the big day. We brits don’t need much of an excuse for a party, but a royal wedding is as good a reason as any. Admittedly, for some the excitement is due to an extended break from work, tagging the Easter holidays onto the royal wedding weekend. But I can’t wait to see what Kate will choose for her flowers and dress. 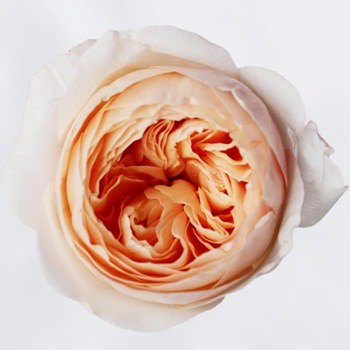 It has been banded about that Prince William and Kate might decide to go for British flowers, which would highlight the gorgeous cut flowers we can produce in Britain. It’s a little early in the year for some British grown flowers, so they would be limited to spring pretties if they did choose to stick with just home grown flowers. 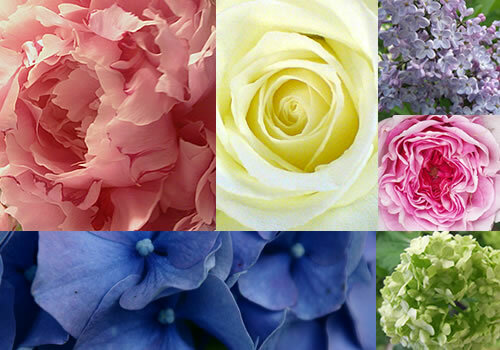 I would love to see William and Kate go for British flowers, and a selection of spring flowers would be beautiful. Tulips, anemones, hyacinths, narcissi and lily of the valley are all available in April. When Camilla married Charles, Prince of Wales in 2005, she carried a pretty wired posy of lily of the valley and primroses for her bouquet. The wedding was quite low key and her petite bouquet reflected this. It included some Myrtle from Queen Victoria’s Garden on the Isle of Wight. Queen Victoria included a sprig of Myrtle in her wedding bouquet and then planted the Myrtle in her garden afterwards. Since then all royal brides have included Myrtle in their bouquets including Queen Elizabeth II and Diana, Princess of Wales. Myrtle is said to be the herb of love and is thought to bring good luck. It is expected Kate will include Myrtle in her bouquet too. Kate’s flower choices will obviously depend a lot of the type of dress she wears. If she picks a fairy tale style dress with a large full skirt she may choose a trailing shower bouquet to balance the dress. 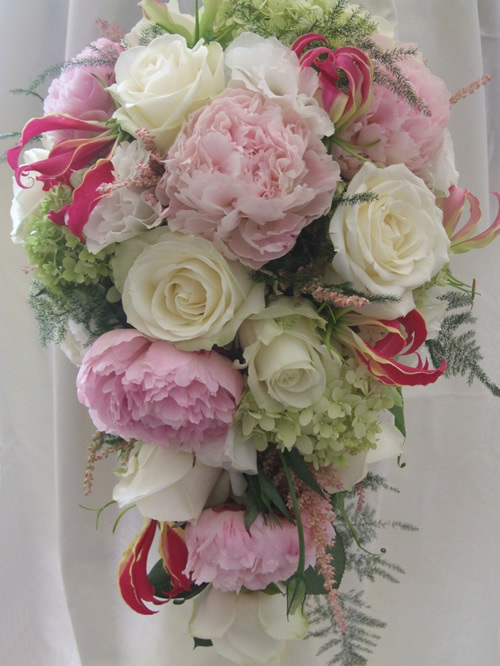 This type of bouquet is usually thought of as more traditional. Shower bouquets have seemed to be out of fashion for many years as handtied bouquets were so popular. But teardrop shape bouquets have been making a comeback recently, either as a smaller more compact version with a lot less fussy foliage or as a very modern waterfall design constructed on a decorative wire base with minimal flowers wired on. My bet for Kate’s flower style is understated elegance. I think she will go for a teardrop shaped bouquet in neutral colours, not a large bouquet with long foliage like Princess Diana had, but a simpler contemporary version. Most spring flowers are not very well suited to trailing bouquets as they are wired, so I’m not sure Kate will pick British flowers, since she would have to use spring flowers at this time of year. Whatever flowers Prince William and Kate decide on for their big day, I’m sure they will be fabulous. Kate always looks very elegant and stylish. I just hope the sun shines for them on the 29th.